The following series of posts will (briefly) examine some of Whitaker's arguments where he proves that the binding authority of God's Word on us does not depend on any declaration ("judgment and authority") of the Church. He makes at least nineteen such arguments (although it is unlikely we will examine all of them). Then Scripture has an intrinsic authority over us that does not depend upon the decrees of the Church. As for the consequent, Whitaker gives four supporting reasons. I've decided to limit this post to the second and fourth reasons, which I found to be the most reasonable and least confusing. The judgment of fathers, councils, and the church, is but recent, if we respect the antiquity of scripture. If therefore the authority of scripture depend upon the public judgment of the church, then doubtless for many centuries there was no certain canon of scripture. Fathers, indeed, and councils enunciate the canonical books; but those books both were, and were esteemed, previously authentic, and canonical, and sacred, as is plain from those fathers and councils themselves. Let them produce any public judgment of the church, and it will readily appear that the scriptures were deemed canonical before that judgment. ii) This is also functions as a useful historical observation. The early church did not approach the canon as something that could only be truly known through the decrees of councils. This is yet another disconnect between the modern Roman Catholic denomination and the early church. If the church be gathered together to consign the canon of scripture, it must needs be so by some authority. I demand, therefore, by what authority it is so collected? If they answer, by some internal impulse or revelation of the Spirit, we entirely reject such revelations which are besides the word, as fanatical and anabaptistical and utterly heretical. 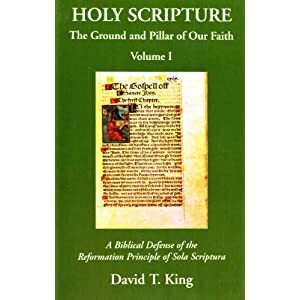 If they say that it is collected by the authority of scripture, then they concede that which we demand: for it will thence follow, that the scripture had a canonical authority before it was confirmed by the judgment of the church. If they allow only this part of scripture which gives such an authority to the church to have been previously canonical, but deny the rest to have been so, they do this without any certain reason. This is an interesting dilemma, and I'm not sure if there's a way out for the Roman Catholic. It seems rather powerful. I do know that modern Roman Catholics tend to take the latter option and argue for the authority of the Magisterium from Scripture (e.g. arguments from Matthew 16:18). But the epistemic dilemma Whitaker is driving at cannot be avoided. If I, as a Protestant, need the Magisterium to know that Scripture is authoritative and binding, of what use is it to quote Scripture to me in order to prove the authority of the Roman Catholic denomination? If I take the Roman Catholic assertion on this point seriously, then I am in no place to rely on Scripture to prove any doctrine or position, let alone that the Magisterium has the authority to identify Scripture. In other words, if Catholics want to use Scripture to prove the authority of the Magisterium to Protestants, they admit that it is already binding on the consciences of Protestants before they come to believe that the Magisterium is authoritative. But if Scripture is already binding before it is known that the Magisterium is authoritative, why do we need the Magisterium to show us what is and isn't Scripture? 1. Patrick Madrid, Answer Me This (Huntington, IN: Our Sunday Visitor Publishing Division, 2003), 128.